This one was heard on the t.v. 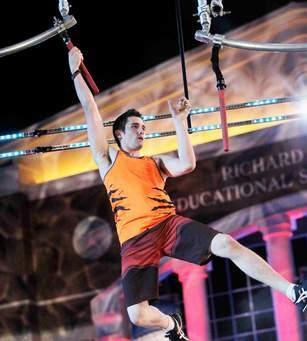 show American Ninja Warriors. It is a nice mash up of “take (pick) up the gauntlet” (to accept or attempt an invitation or challenge) and “setting the bar high” (to establish a desired standard of quality). “Running the gauntlet” (to endure a series of problems or threats) might also be in the speaker’s mind as the show literally requires participants to do just that. Also, “throw down the gauntlet” (to challenge someone to combat or argument) could be in the mix as again it describes the show’s theme. A tip of the hat to Ed Brady who heard this one and passed it on.